Retailers' Black Friday ads and other parts of the holiday season are designed to tap into a very ancient part of our brains. Black Friday sales seem to start earlier and earlier every year. But what makes us want to rush to the stores or online to snap up the best bargains? Those wall-to-wall TV ads — and the holiday season itself — are tapping into a very primitive part of our brains. "There is more of a sport to Black Friday shopping, and people expect some deal, but they aren't likely to get the best deal on a particular item because the best deal may have already happened six months ago," says Sucharita Mulpuru, a retail analyst with Forrester Research. 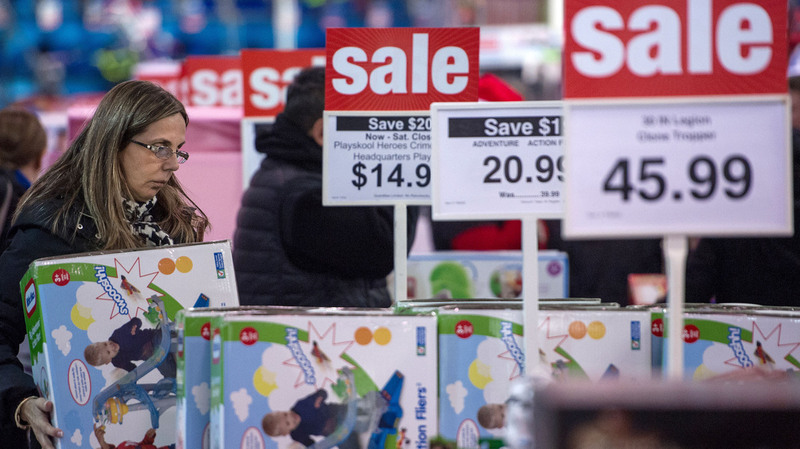 Overall, the best holiday deals don't happen on Black Friday. They usually happen right before Christmas and after. Analysts have been saying that to shoppers for years, and it's something we should all know, but we still go out. "I think it's because of the role that emotions — especially positive emotions like excitement — play on people's decision-making process," says Camelia Kuhnen, a behavioral economist at the University of North Carolina. Kuhnen says our financial decisions are governed essentially by two centers in our brain. One is the fear anxiety center — the part of our brains that reacts to panic or makes us run away from danger. The other is the reward center — the part that's a trigger when we're happy, Kuhnen says. There's run-of-the-mill happy, she says, "and then there's happy-excited. Happy-aroused. Happy-frenzied. And it's really that happy-frenzied state that is driven by a lot of activation in this brain reward center. It's when you feel the impetus to sort of go for it." That go-for-it impulse is what makes the holiday season run. Every single part of the holidays — the music, the food, for some of us the family — goes to get us excited and to activate that primitive part of our brain. "When that happens, people end up making certain choices that are quite interesting," Kuhnen says. "So they tend to take on more financial risk, they tend to prefer, much more strongly, immediate rewards rather than delayed rewards. And they tend to be much more interested in purchasing a good that's showed to them." Sound like those Black Friday ads to you? Meanwhile, the analysts say retailers know about this ancient part of our brain and they've worked on it for centuries. The problem in the age of the Internet is whether they can keep pace. "What's going on, I think: Convenience is a huge thing to the consumer," says retail analyst Howard Davidowitz. He says right now the Internet gives consumers the upper hand. The fight among retailers is to provide the most convenient option for customers. "Everybody — everybody — is trying to capitalize on that. The consumer wants free shipping, and they want it right away," Davidowitz says. And if you're a retailer and don't give that to consumers, "you've got a problem because your competitor will," he says. It's not about which store or brand has the keys to our brain — it's which retailers can get in line first.